Most claims that are $50,000 or less under the traditional model are not worth pursuing. 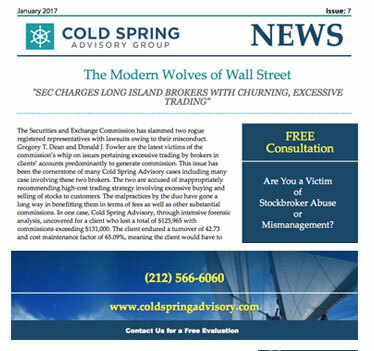 Cold Spring Advisory Group makes your claim worth pursuing. Traditional Average cost of an arbitration $30,000 to $50,000 and up! Cold Spring retainer fee will include cost of filing fees, arbitration panel cost, expert witness cost. Attorneys work on full contingency basis with an average of 70% to client and 30% to attorney. Client incurs NO other costs.